The whale watching season in Santa Catarina started officially a month ago. We can already say that this will be a fantastic season, with record numbers of Southern Right whales making an appearance along our coast. The pleasant surprise of this season has been the constant presence of whales in the beaches of Florianopolis as well. In past years the odd pair was spotted occasionally at some points around the island, but this year the appearances have been frequent. The Southern Right can reach up to 18 meters in length and when nursing tend to stay very close to the beach. 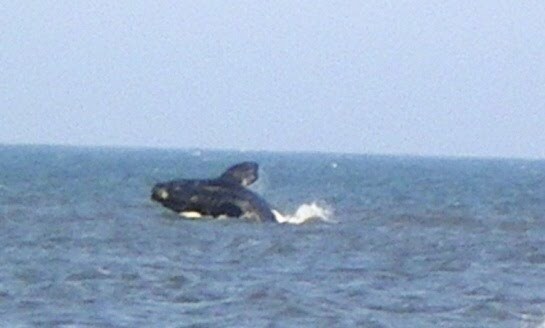 In Pantano do Sul bay, in the extreme south of the Island, 2 or 3 pairs of mother and calf have been seen almost daily for the last 2 weeks. As Pantano is a secluded bay with calm waters, the whales are easily spotted from shore and became a local tourist attraction. This young whale was caught in mid-jump by a tourist last week. For a closer encounter with these giants of the sea, you only have to travel a couple of hours to Garopaba or Imbituba, in the Southern Santa Catarina Coast, where you can take a whale watching boat trip. Praia do Rosa is an excellent base for the whale watching trips. Stay at least two or three nights in the area to have a better chance of doing the boat trip, as departures are dependent on sea conditions.